The philosophy at Ovaltop Holsteins has always been to breed a top herd of registered Holsteins while improving each generation by pursuing exceptional type, outstanding production, and enhanced genetic potential. The Wolfe family has surely accomplished those goals. Ovaltop Holsteins of Richfield Springs, N.Y., has been selected by the Klussendorf Association as the tenth recipient of the Robert “Whitey” McKown Master Breeder Award. 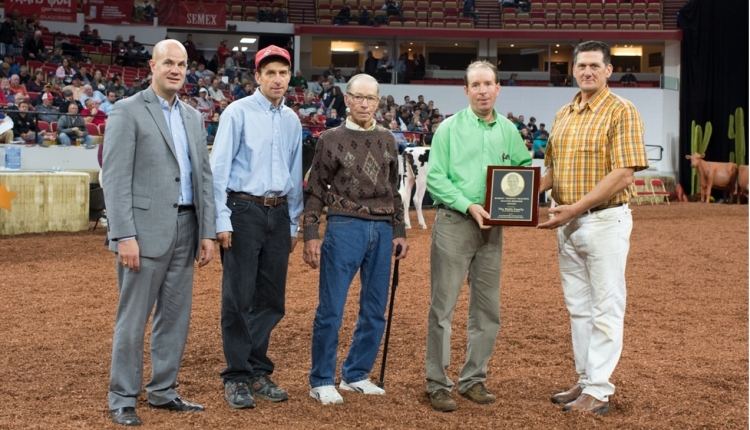 This award recognizes a well-managed breeder and herd that has been successful at showing and judging dairy cattle. Howard, Ginny, Doug, and Mike Wolfe have developed Ovaltop Holsteins into the highly recognized herd it is today. Ovaltop Holsteins’ prefix dates back to 1929 and has since bred 170 Excellent cows. They have bred four Excellent 94-point cows, 13 Excellent 93-point cows, 23 Excellent 92-point cows, 43 Excellent 91-point cows, 87 Excellent 90-point cows, along with 427 cows scored at Very Good. In addition, they have developed 25 Excellent cows that were purchased from other herds. The Wolfe family was originally from New Jersey but relocated to Richfield Springs, N.Y., in 1977 where they now milk 90 cows. The herd is 100 percent registered Holstein, and they farm 500 acres of land. The Ovaltop herd is a 28-time Progressive Breeder of Registry (PBR) herd, which is currently the longest running streak in the state of New York. The Wolfe’s lactation average on the 90-cow herd is 26,519 pounds of milk and they have a Breed Age Average (BAA) of 110.3. BAA compares all herds on confirmation and their 110.3 rating ranks in the top 100 herds in the entire United States. One of their favorite cows that just finished its career is Ovaltop Chesapeake Nikita-ET (4E-93). She is part of a multigenerational homebred Excellent family that started with Lemax Valiant Nada (3E-94-DOM) and was one of Mike Wolfe’s best show cows. The Wolfes have also bred one Gold Medal (GM) Sire, eight Gold Medal Dams (GMD), and 11 Dams of Merit (DOM). Never afraid to add foundation genetics to their herd, Ovaltop has integrated members of the most prestigious cow families of the breed. These families include C Glenridge Citation Roxy (EX-97-GMD), Cherown SY Delilah (EX-96), C Alanvale Inspiration Tina (EX-95 GMD-DOM), KHW Regiment Apple-Red-ET (EX-96-DOM), and many others. Howard and Ginny have also been honored by the New York State Holstein Association along with the national association for their dedication and commitment to the Holstein industry. They were named the New York State Active Master Breeders in 2000, New York Holstein Association’s highest honor. Ginny was named “Friend of New York Holstein” in 2011. Many times, the family has been honored with Premier Breeder and Premier Exhibitor titles on the local and regional level, including at the New York State Fair, New York Spring Red and White Show, New York International Spring Holstein Show, Pennsylvania All-American Red and White Show, and other prestigious shows. They have also garnered numerous All-New York and Junior All-New York awards. Several Ovaltop bred animals have been nominated for All-American honors. The Ovaltop show team also takes pride in their multiple herdsmanship awards at shows. Their display is always attractive, neat, and appealing to visitors. The entire family has been active in the local Otsego-Herkimer-Montgomery (O-H-M) Holstein Club and all its activities. Mike and Monica Wolfe, representing the next generation, have four children, the oldest of which are very involved in their local Holstein and 4-H clubs. They enjoy cows and showing as much as the rest of the family. Mike’s brother, Doug, currently serves on the Show Committee for the New York Holstein Association, which he chaired for several years, and Ginny is chairperson of the Publications Committee. Ovaltop is a longtime, monthly advertiser in the New York Holstein News. Both Doug and Mike are accomplished judges and have officiated at shows throughout New York and the Northeast. The entire Wolfe family is passionate about agriculture and breeding outstanding registered Holsteins. The family’s dedication to their farm, their local and state Holstein associations, and their community have earned them the honor of 2018 McKown Master Breeder.